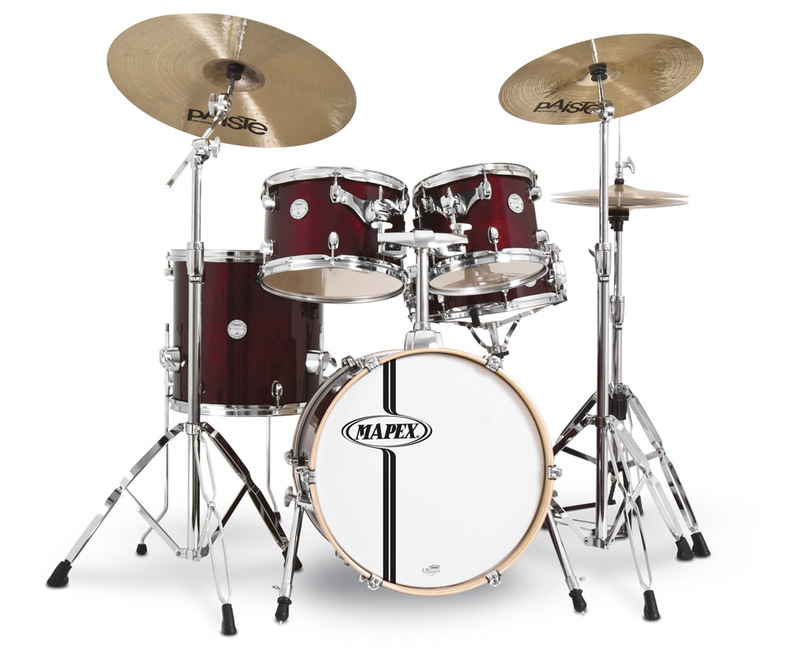 Now replaced with the “Mars” series, Mapex’s Horizon Birch line of drums were the step up from the entry level Voyager series up to and including last year. 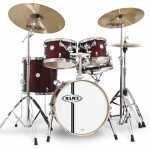 The newer Mars features all birch shells, while the Horizon Birch were Birch/Poplar hybrid. 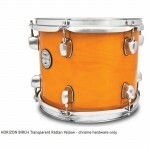 No longer in production, Horizon Birch kits are still widely available and advertised both online and in stores. Often spotted at a “street” price of US$550 for the five-piece shell pack (US$800 List price), the “Big City” looks like a fabulous value-for-money option. 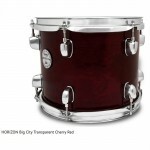 Here at CompactDrums.com we have purchased a “Transparent Cherry Red” kit, dissected, disassembled, examined, measured and tested every aspect of it in this Mapex Horizon Big City Review. Read on for the whole scoop and our verdict on this value priced Bop kit. The red finish on all shells is very nice. It’s on the thin side, and not like a perfect sheet of glass, but at this price range it’s far nicer than expected. Even though the red colour is quite dark, the wood grain is clearly defined. I would say the extra step was taken to first stain them black and then sand the black down, leaving only the deeper hints in the grain. A process not commonly used on budget level drums. Also peaking through the clear heads, the interiors look uniform, smooth and even. As do the bearing edges. The chrome is a different story all together. On most parts the plating is thin, covering a less than smooth surface which results in a dull chrome finish. 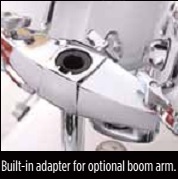 This is true throughout the chrome parts except the four (total) lugs on the rack toms that secure the suspension mounts. These four are clearly from a different batch. Likely a thicker gauge since they have the weight of the toms to support. Overall the metal parts are on the flimsy side, quite light and thin. The hoops are a mere 1.5 mm. The bass drum hoops, which appear to be maple, are incredibly nice with a much thicker and “glassier” clear coat than the shells. So far it almost appears as if the shells and hardware are mismatched, with the shells coming from a higher priced product line. Before assembly and initial test drive, the stock Remo UX batter side heads are removed allowing us to measure the tolerances. First up is the floor tom which displays quite pleasing results. 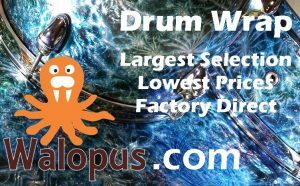 It’s about 1 mm out-of-round which is better than average in an entry level drum. Next we check the trueness of the bearing edge on a 24 X 24 inch granite slab. The floor tom sits flush all the way around. Not even a hint of light escapes between the granite and the drum anywhere along the edge. 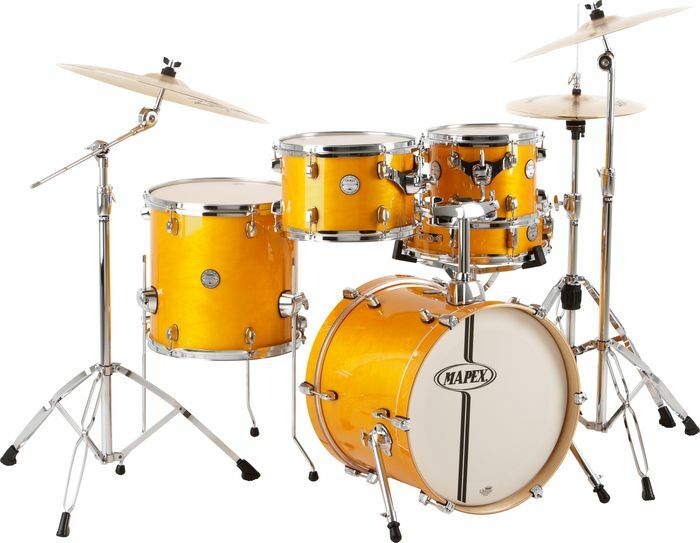 A result we rarely see even on much pricier drums. The bearing edge is near perfect, but could do with a light sanding with 500 grit paper. The direction of the router can be felt running a finger along the edge. Smooth as silk in one direction but slightly coarse in the other. The peak is sharp. An ever so slight smoothing over would be beneficial. Still the bearing edge more than meets our expectations. The quality of the bearing edges are consistent throughout the kit. Unfortunately that’s the end of the consistency. 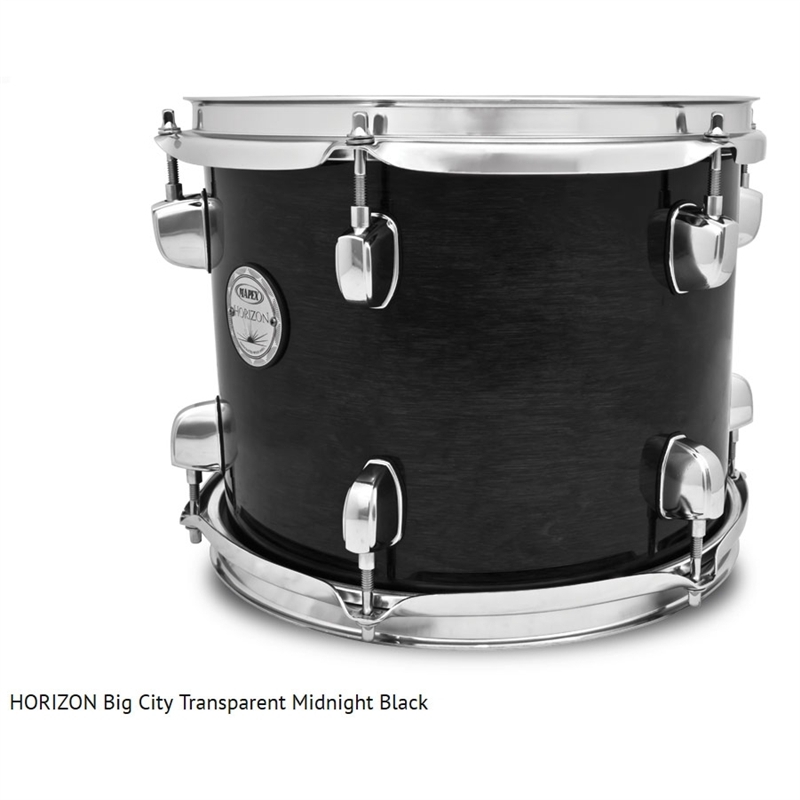 The 10″ tom is perfectly round and 0.8 mm out-of-flat. which isn’t horrible but could be better. The 12″ tom is 0.5 out of round and just about 1 mm out of flat. -Still within the acceptable range. 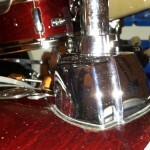 The bass drum, like the floor tom is perfectly flat and only 0.4 mm out of round. -More than acceptable. 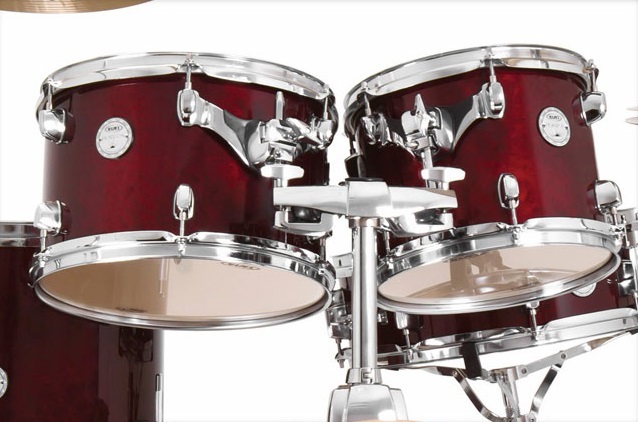 The snare drum however is a whopping 1.7 mm out-of-flat and 1.6 mm out-of-round. I don’t recall ever seeing such poor results on any snare drum before. All the shell interiors are fairly smooth and perfectly even and consistent. 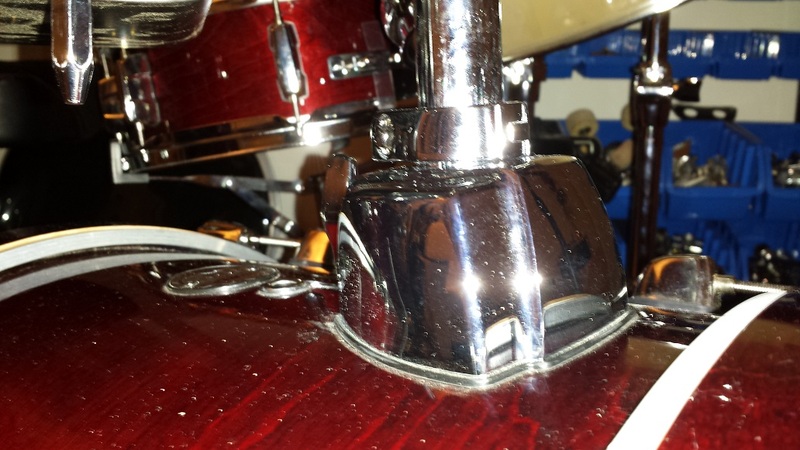 On a side note and only relevant from a visual perspective, the tom mounts, mounting platform on the bass drum, spur shoulders and floor tom leg brackets all have a distinct design giving the entire kit a bit of it’s own personality. 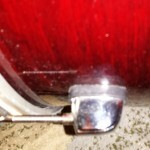 Also noteworthy are the bass drum lugs. They are identical to the tom lugs, but sit on a thick shim rather than just the thin isolation gasket. Likely due to streamlining manufacturing. -Clever. 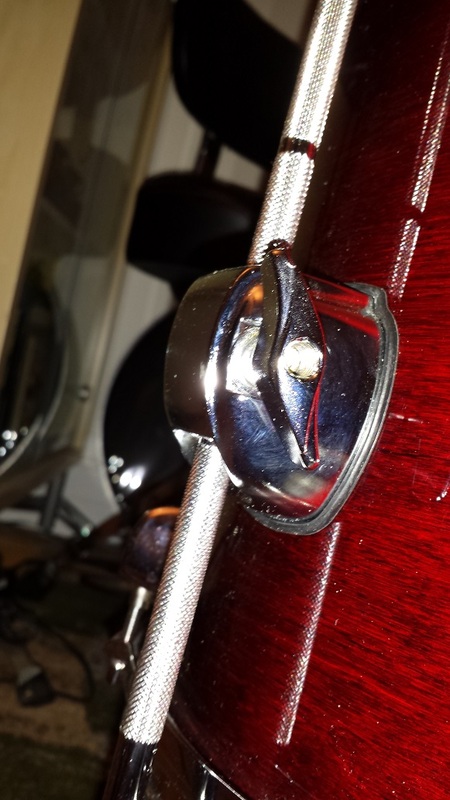 The tom and bass lugs are only attached to the shell with one screw each. Certainly a cost-cutting measure, but spun as a feature; “Single-Point-of-Contact Lugs”. 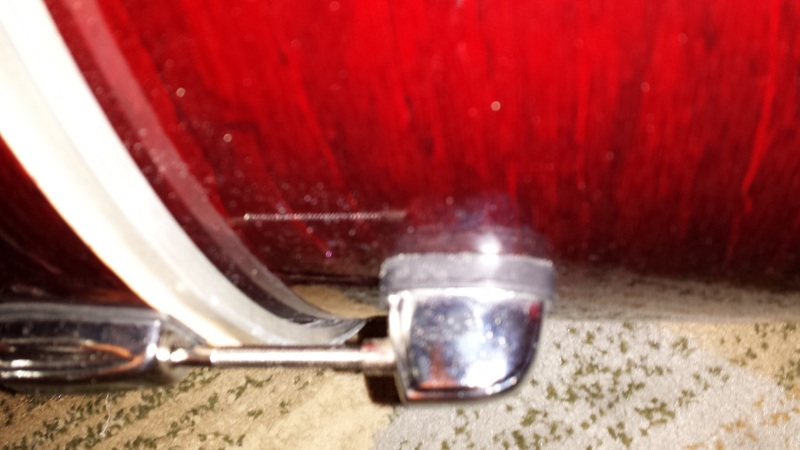 There are only six lugs per side on the bass drum which is barely adequate on an 18 inch. The lowest point on the hardware list is the snare strainer. 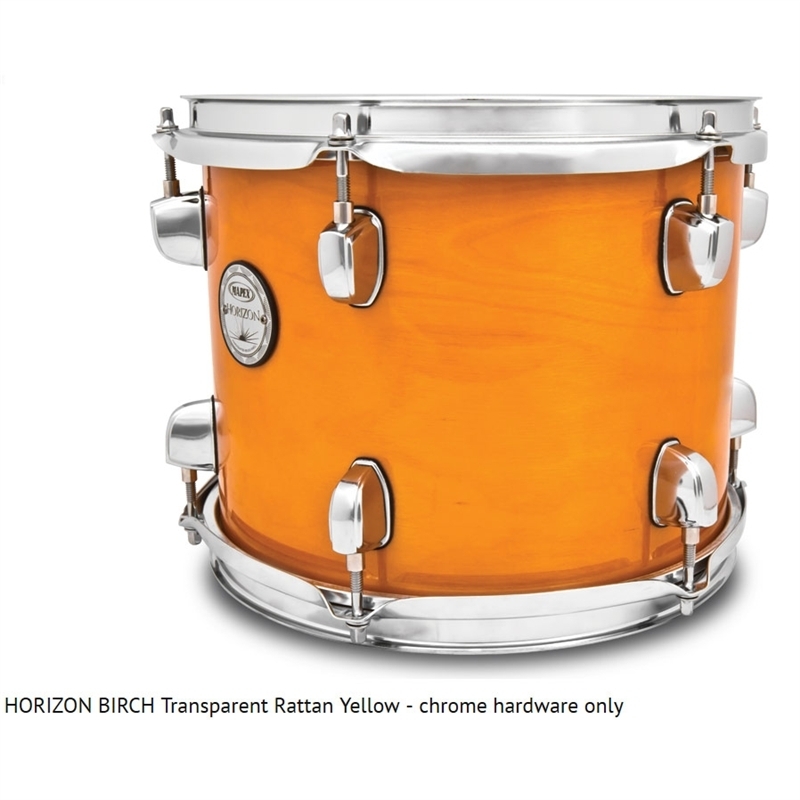 It’s identical to the ones found on “CB” snare drums. Although functional, they are quite “cheesy”. The batter sides receive Weather King Emperor heads instead of the UXs. 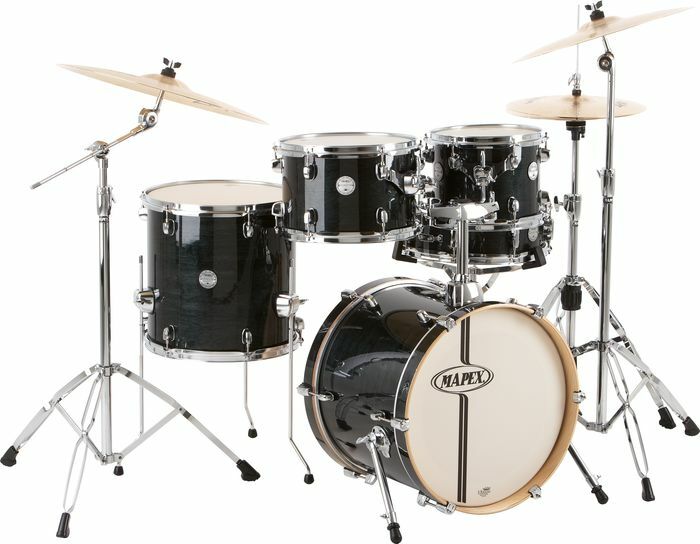 After-all, reviewing a drum kit with UX batter side heads would be like reviewing a car with sub-standard gas in the tank. We leave the stock heads on the resonant side though. The bass drum gets an Aquarian II, for no other reason than it was the only 18″ head laying around. All tension bolts run smooth in the threads and are adequately lubed from the factory. Before assembling the kit, we tune up the drums roughly to where we’d like them. 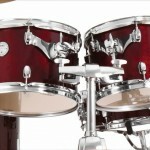 The bass drum is quick and easy to tune despite only having six lugs per side. We tune the rez head as low as possible without any slack and the batter side head just a tad tighter. 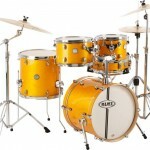 The floor tom is also easily tuned and responds with unbelievable sustain that rings for days. Tuning the rack toms high enough for our taste took a bit of finagling, as they are quite prone to some rather unpleasant “clangy”, almost timbale-like overtones. A bit of tweaking with the balance between top and bottom got them sounding adequately pleasant though. The snare was the most stubborn, not surprising giving the tolerances we measured. Tuned low, the best I could do was something that resembled a tin can with a few large rocks inside. Tuned high I managed to get it to sound like a snare drum, even if just barely and after half an hour of tweaking. 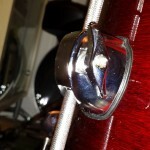 I’ve had better experiences with snare drums from sub-$300 kits. Assembly was straight forward and without issues. All hardware components function satisfactorily and even somewhat smoother than expected. After some more tweaks with the tuning the results are a pretty decent sounding drum kit. (Apart from the snare) The toms have ample sustain and even though I rarely recommend any dampening other than the relationship between the heads, I did in this case put those mylar circle “thingys” on them, which did the trick. I’ll attempt to square the snare and cut new edges on it, but for now, we simply put it aside and enjoyed a couple hours of jamming with a substitute snare drum. Although some aspects of the Big City are impressive; Shell Finish, Smoothness and Design of Hardware, Bass Drum Hoops and overall Aesthetics, these factors aren’t enough to outweigh the poor tolerances of the snare drum, dull chrome finish and flimsy, thin steel parts. It’s possible that our snare was a lemon and had luck favoured us with a better sample, our verdict would be different. 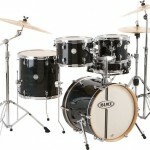 After-all we don’t expect perfection for $550, but there are a lot of drum kits to choose from in this price range. 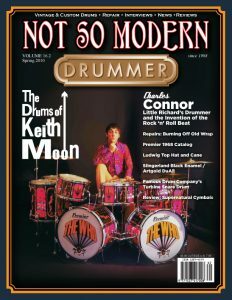 This would still be an OK choice for someone with a favourite snare already or if there is an opportunity to try before you buy.